Slogans carry messages of ‘TIME FOR CHANGE’ ‘GOOD GOVERNANCE’ ‘END TO CORRUPTION’ ‘ABOLITION OF EXECUTIVE PRESIDENCY’. Let’s be realistic about the 2 main camps. Neither side is lily white nor likely to be. This is the reality that the people need to accept. On both camps skeletons prevail and both sides have their share of nefarious characters. The people’s dilemma remains how far will change depart from the areas that the People identify as needing change? The next dilemma for the people is if there is going to be no change inspite of voting for change, will that change lead to worse scenarios than that which the country presently suffers? The question boils down in the end leading the people with no other choice but to choose the lesser evil. For those presently supportive of Maithri the question is whether to vote for him aware of the commotion likely to result in fulfilling the wishlists/demands of those backing him or for those in the Rajapakse camp who have lived 9 years under his rule, to envision the achievements as against the ills his rule is accused of via propaganda. More than half of those in the Alliance are those who have crossed over from the Government after elections were announced. Having crossed over their lists of woes against the Government are many yet the unanswered question is why did they not depart (before elections were announced) if they could not watch corruption take place? Gamini Jayasuriya was against the signing of the Indo-Lanka Accord and he not only resigned but gave up politics altogether. The question is why did people who crossed over wait till elections were announced to do so? They do not have an answer. When they can’t answer can the public place trust in them and moreover can the new camp even trust each other if for political gain they will create lies beneficial to them? If the President now has eyebrows raised about who to trust within his own Government all those in an alliance that is supposed to be ‘common’ are unlikely to trust one another because the only common factor gluing them together is the hope that they will gain power on 9th January yet realistically ‘they’ can’t come into power, only ONE person can and that person would be Maithripala Sirisena or Mahinda Rajapakse. This leads to the next question how will Maithripala govern the nation as per wishlists presented by all those aligning to support him. They are not supporting him without wanting their demands met. How do these demand complement each other or contradict each other. We must remember that this is a Presidential Election and not a General Election. Moreover, how many in the alliance signed agreements that are not disclosed to other members of the Alliance – as an example we can give the agreement secretly entered into between CBK-Maithri and TNA omitting Ranil and the UNP without whose support no common candidate can win the election. How troublesome will governance be if Maithri’s alliance members discover that their demands are being overruled because of agreements with others or how will alliance members react when Maithri does the opposite to what he promised to do. Will the country end up in chaos and is this the Arab Spring that is being created? What is the risk factor involved for the voters. Let us remember that Sri Lanka is a nation that is enjoying just 4 ½ years of life after suffering 30 years of terrorism. People remember too well all that they suffered – the fear of parents sending their children to school/class, fear until husbands returned home, the fear to travel, the restrictions to travel, the fear of going in public transport or to public places. None of these factors exist anymore. Nevertheless, it must also be accepted that many who indirectly and directly helped terror prevail by their actions, inactions, delayed actions and decisions remain still around us including the party we know as TNA identified even internationally as being mouthpieces of the LTTE. That the Government showed little interest to take action against the TNA for their role in terror even after 4 years and compelling evidence against them has enabled the TNA to even contest elections and put a foothold in the North and influence the people via their connections to the Diaspora and foreign forces out to divide the nation. This factor has to play a pivotal role among voters because any agreement secretly signed between a handful of members in the Common Alliance with the TNA does not display credibility or trust and should in fact ring alarm bells in how far alliance members who do not have any power over Maithri can actually stop a CBK-Maithri pact with TNA from being implemented vis a vis the demands of the TNA that echo those of the LTTE. The same warnings have been given about encouraging extremism among Muslims tied to other terror factors globally as well for this is likely to be the next stage of Sri Lanka’s troubles. The voter must wonder how will other members of the alliance be able to reverse any bad decisions made by the common candidate if he were to implement detrimental demands first. The voter meanwhile needs to also wonder in what ways President Rajapakse is willing to accept some of the negative points that he and his government is currently being accused of? President Rajapakse needs to urgently show gestures that he not only acknowledges that some of the accusations may be true but also that he will give assurance to remedy them. These reversals are far more harmless than the handling of reversals if TNA were to be given 13th amendment in full, assurance to remove all military from the North or even remove all non-Tamil settlers from the North. Let us not forget that CBK signed the PTOMs that gave virtually everything to the LTTE in all but name ‘Eelam’ and to reverse all that Ranil through the CFA and CBK through ISGA/PTOMs gave 30,000 soldiers ended up sacrificing their lives and more than 30,000 remain alive with injuries for life. The people are not prepared to send another set of sons to their deaths again for experiments and taking risks not worth taking. The 2015 election has shown that no politician is to be trusted and that they are only interested in their own personal gain. There is therefore little point in blaming or praising anyone who crosses over from one side to the other or those that indulge in multiple cross overs either. Their decisions have nothing to do with what is best for the people. 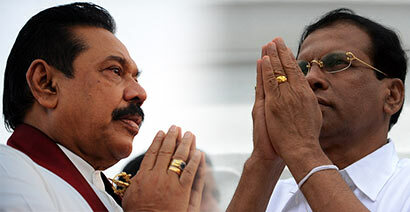 These are good shocks for even the President to realize that none of his men or women are to be trusted which has to be the same for Maithripala who should also realize that he too betrayed the trust placed upon him as General Secretary of the SLFP and the same will happen to him one day. Thus, the two leaders will both be sceptical on who they can actually trust. Anyone who emerges President must realize that there is a need to set some systems and mechanisms in place. Undeniably there is the need to give place to those competent, to reduce waste, corruption is a factor that fingers cant only point at politicians. How many driving SUVs have not bullied the policeman stopping them for driving violations, how many among the rich have not used money get favors done…thus corruption prevails all around us and among us and until changes come from the people themselves simply pointing fingers at politicians only will not do. Whatever the quantum, corruption is corruption and whether it is politicians, public officials, or ordinary people the act is the same. Therefore, there is little point in anyone in either camp pretending to be angels because their actions have shown them to be far from angels. The public does not need anyone to pretend they are angels. Mahinda Rajapakse became President in 2005. In 4 years he won a war that 5 leaders could not. He became President against in 2010 and thereafter went on a rapid development drive with visible changes. Inspite of these developments he is accused of nepotism, corruption by politicians and public officials, appointment of incompetent officials etc. Maithripala Sirisena has been the choice to divide the Buddhist vote because the main UNP cannot win an election without the votes of the majority Sinhala Buddhist populace. The candidate is thus chosen not for any of the allegations but to create a mathematical possibility to generate votes and depose the President. Is the goal to bring good governance or simply to usurp the President and then think about how to run the country? The public will also note that Maithripala was not the choice of the people, he was parachuted into the position of the Common Candidate by unforeseen forces and therefore the power that these unforeseen forces yield over the Common Candidate will remain an open-ended question. People were expecting Ranil, Karu, Sajith to contest being the main Opposition party. It was the same unforeseen forces that propelled Sarath Fonseka to contest the 2010 Presidential Elections. The people must next wonder how to identify what they feel are grey areas that the President needs to address and these areas are necessarily those that affect the people and not those that impede the lifestyles of a minority of others who now want to put their eggs in another basket and see how far they can profit from that basket. What this election would have shown President Rajapakse is that the people will back him so long as he upholds what the people desires and this establishes where and to whom President’s loyalty lies and it will be the President who would most likely want to clean up his closet first and usher a new period where the third phase of his rule should be to build up society. The people essentially need to next wonder what if in taking the risk to vote for Maithripala what are the likely scenarios that may emerge: do the people really want the abolition of the executive presidency or do they prefer the repealing of the 13a? Will Maithripala remove the military from the North and non-Tamil settlements from the North as promised to the TNA unknown to Ranil or UNP? Will Maithripala hand over powers to Ranil or will he give it to CBK now that he has promised a prominent role for her? Will Ranil and UNP end up high and dry inspite of getting their support base to vote for Maithripala? How can Maithripala realistically accommodate all the wishlists and demands made by different parties/individuals supporting him most of whom cannot contest under the UPFA having now crossed over? Moreover, crossing over does not necessarily mean that their votebases will also change allegiance and thus there is no assurance that the public will vote them into power at the next general election, but the reality is that all of them cannot come as national list candidates also! The majority Buddhist population appears to be the people that will be the decider but exactly what is the deal they are getting? The people would definitely be mindful of what the minorities have been given post May 2009 as against what the majority Buddhist populace have been given a thought politicians cannot well afford to forget now that the Opposition realizes where their shortcomings are. Thus, the there is a thin line between victory and defeat and the Buddhists hold the key to the selection and election. The system is what needs correcting. The first place for people to start is by not voting for corrupt politicians at the next election whatever party they belong to. This is a start and the coming general election is a good place to see how people who are against corruption will not cast their vote for corrupt politicians. Nevertheless, another reality is that the system that politicians come into power, the money needed to promote themselves amongst the public and the funds needed to run a campaign necessitate links with some good for nothing characters who end up wanting their piece of the pie afterwards for the help rendered and so whether elected politicians like it or not they end up trapped before they even begin governance. There is a larger picture that we need to be aware of before pointing fingers. Nevertheless, despite the dilemma’s the voter is faced with no voter concerned about the country will want to reverse the gains achieved since 2009 or compromise the country and make it destable. Just as much the country must remain stable the leader that the people must elect must be stable as well. Yes, that’s right, this’s to select the lesser evil, because the absense of a god. Unseen evil forces have brought this common candidate to divide the buddhist votes and then destroy them. Those unseen forces may going to topple this govt and make Srilanka an another Siria with Sirisena. This might not be a chance to learn for fools. Leasens learned already and now choose to live or believe. In an ideal world there will be no corruption, but this is not an ideal world and never will be. Only heaven is pure. Any candidate has his/her faults, because we are all human. Hon MR has proven himself to be a true patriot who has implemented his Mahinda Chintanaya, by first ending the 30 year terrorist scourge of LTTE and utterly destroying them. Since then he had been proactively building the infra-structure of the country and its economy. Today, our economy is at 7% and rising like China’s, while in the West their economy is at a an all time low of 0.5-2%. Our GDP has risen and continues to rise. Hence in gratitude, the people of this great country must once again elect as President the very man who has led the country ably and not a Judas who cannot be trusted, whatever promises he makes to the masses. He is corrupt to the core and is only interested in selfish accumulation of his personal wealth. This fellow Maithripala has no acumen, no vision and no written policy as Hon MR does. I pray and hope Hon MR wins with a thumping majority to rub dirt on the faces of CBK,Ranil,TNA and USA.